This species has the deepest orange petals of the genus. Although the plants are of the general stature of E. californica, they have a barrel-shaped receptacle (unlike the conic receptacle of E. californica) without a rim, nodding pubescent buds, and slightly pubescent foliage. 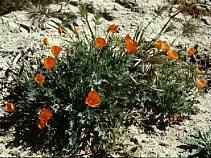 The species is found in the dry grasslands of the inner south Coast Ranges and southern foothills of the Tehachapi Mountains. Plants of the Tejon Ranch area with erect buds are ssp. kernensis (Tejon poppy). E. lemmonii E. Greene - PLANT annual, 0.5-3 dm tall, erect or spreading, sparsely hairy. LEAVES basal and cauline, terminal divisions generally obtuse. INFLORESCENCE cymose or solitary. FLOWERS nodding in bud; receptacle barrel-shaped; calyx pointed, hairy; petals 1.5-4 cm long, orange or deep yellow. FRUITS 3-7 cm long. SEEDS 1.3-1.8 mm diam, ellipsoidal, reticulate, brown. 2n=12. Open grasslands; 200-1000 m. Inner south Coast Ranges, Tehachapi Mountains, extreme southern Sierra Nevada foothills. E. lemmonii subsp. kernensis (Munz) C. Clark - PLANT annual, 0.5-3 dm tall, erect, glabrous or slightly hairy. LEAVES basal and cauline, terminal divisions generally obtuse. INFLORESCENCE cymose or solitary. FLOWERS susally erect in bud; receptacle barrel-shaped, calyx pointed, glabrous; petals 2-4 cm long, orange. FRUITS 3-7 cm long. SEEDS 1.3-1.8 mm diam, spherical to ellipsoidal, reticulate, brown. Uncommon. Open grasslands; 200-1000 m. North slopes of the western Transverse Ranges, southwestern Tehachapi Mountains.